Doha is world-famous for its collection of souqs, which are largely open-air marketplaces selling a wide variety of goods. Shopaholics will feel as though they've died and gone to heaven when perusing Doha's incredible range of souqs, where anything and everything can be bought. 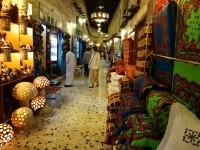 The most famous of Doha's traditional marketplaces is the Souq Waqif ('the Standing Market'), which sells gorgeous traditional garments (including Bedouin cloth), spices, perfumes, handicrafts, and the best range of authentic Qatari souvenirs (such as dullahs and khawas, traditional coffee pots, and small accompanying cups). Souq Waqif also has a fine selection of restaurants and food stalls turning out things like traditional fare, international cuisine, and a couple of popular shisha bars. Tourists looking to buy jewellery or gold in Doha should check out the Gold Souq, while those seeking a unique cultural experience should check out the Camel Souq and Falcon Souq (both located in downtown Doha's E-Ring), where you will be amazed at the prices that these magnificent animals can fetch. Whether you're a committed shopper or just an eager tourist looking to get to grips with the local culture, Doha's souqs are a fine place to spend many hours of your Qatar holiday. Be prepared to haggle: this is a normal and accepted part of the shopping experience.